The High Technology Foundation performs research and development projects in physics, electrical engineering, computer science, and related fields for a wide range of government and industrial customers. 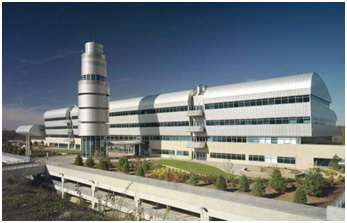 Working in state-of-the art laboratories in the Robert H. Mollohan Research Center, this multi-disciplinary group of scientists and engineers works closely with university researchers, industrial partners, and government customers to perform ground-breaking research and develop leading-edge technologies. The High Technology Foundation has a highly-trained staff of experienced engineers and PhD scientists, working together to solve challenging problems and develop new technologies. The Foundation’s capabilities are currently divided into four technical focus areas: Optics and Photonics, Data Analysis and Signal Processing, Power Electronics and Electromagnetics, and Space Weather and Theoretical Plasma Physics. R&D Laboratory facilities include a Photonics Lab, Laser Lab, Power Electronics Lab, Wide-Area Surveillance Lab, Chemistry Lab, Electronics Shop, and Machine Shop.